1. Childhood immunization does not continue into adulthood. So now you folks can stop asking me, “Weren’t you immunized as a child?” A CDC study suggests that immunity only lasts for 3-6 years. Adults can get the Tdap (pertussis and tetanus) vaccine. 2. Pertussis is highly contagious. When an infected person coughs, tiny bacteria-carrying droplets are sprayed into the air and inhaled by people nearby. Mom was right: cover your mouth when you cough. 3. The contagious state is estimated to be 3 weeks from infection by the Bordetella pertussis bacteria (although that is difficult to pinpoint because pertussis can be preceded by a respiratory infection and has an incubation period of 7-10 days) or 5 days after start of antibiotic treatment. 4. Antibiotics do not shorten the duration of the illness, unless administered very early, but they do stop its spread. If you are infected, it’s a good idea for other family members to receive prophylactic antibiotics. 5. Over-the-counter medications aren’t very effective. I found thyme tea to be helpful in suppressing the cough and expectorants, for getting rid of the, er, gunk. Antihistamines, codeine, and commercial cough remedies did not help me. 6. Pertussis declined in the US in the 1940s, when the vaccine was introduced, but has been increasing since the ’80s (reasons unknown). 7. Pertussis is also called the 100-day cough. It can stop after three weeks but it can last for months. 8. Pertussis is very difficult to diagnose. During the initial catarrhal stage, it is often mistaken for cold, bronchitis, flu, allergies, and asthma. The second stage, paroxysmal coughing, is when the characteristic “whoop” (gasp for breath between coughs) may appear in 50% of adults who are infected. Pertussis is very difficult to culture in a lab, so the most common test is a seriological test for pertussis antibodies, which isn’t very accurate (only shows that you were exposed). 9. Severe coughing can cause broken ribs, disrupted sleep, abdominal pain, fainting, vomiting, and incontinence. No joke. You may think thyme tea sounds disgusting but if you have ever had a night disrupted by several bouts of coughing and gasping, you’d be willing to swallow anything just to get a good night’s sleep. 10. Pregnant women are advised to get the Tdap vaccine to protect their infants. The vaccine is safe during pregnancy. On the other hand, pertussis can be fatal to infants and many of the babies who contract pertussis were too young to vaccinate. So this piece of advice seems sound and is on the CDC site below. I haven’t blogged lately because I’ve been too busy with the war in Gaza and the war with whooping cough. My husband caught pertussis first, gave it to me, so we’re both coughing. I’ve learned some interesting things: childhood vaccinations against pertussis do not continue into adulthood. Pertussis can be difficult to diagnose because it starts out with cold-like symptoms and is easily mistaken for flu, asthma, bronchitis, and allergies. It is highly contagious and can be fatal to infants, so if you suspect that you have it (bad cough that goes on for weeks), go to your doctor. A three-day course of azithromycin will greatly shorten its duration and limit the contagion. You’ll still be coughing but not for as much as you would if you did nothing. Here’s a cough remedy that is all over the Web. I found it helpful. It’s not too unpleasant to drink (like drinking a spicy vinaigrette) and it’s easy to make with kitchen ingredients. I wouldn’t give it to children, though. It’s too strong-flavoured for young palates and unpasteurized honey should never be given to young infants. Combine the ingredients in a jar, close, and shake. take by the teaspoon. I refrigerate mine, but I’ve heard that it’s fairly stable at room temperature. I will also be trying thyme tea, as soon as I can get my husband to pick some up at the healthfood store or the shuk. One missile fell close to home. I was at work, getting ready to leave for the day, when the alarm sounded in Jerusalem. I grabbed my backpack and went into one of the internal staircases. I waited until I heard a couple explosions (Iron Dome intercepted two of the rockets) and then went out to catch the minibus. At the grocery store I ran into a neighbour who said that the siren had sounded in Maale Adumim, she heard a loud bang, and the ground shook. The rocket landed about a kilometer or two down the road. We’re not protected by the Iron Dome system. Our son is halfway through his military service. We don’t see much of him these days. He works 12-hour shifts and tries to find time to call us every few days. 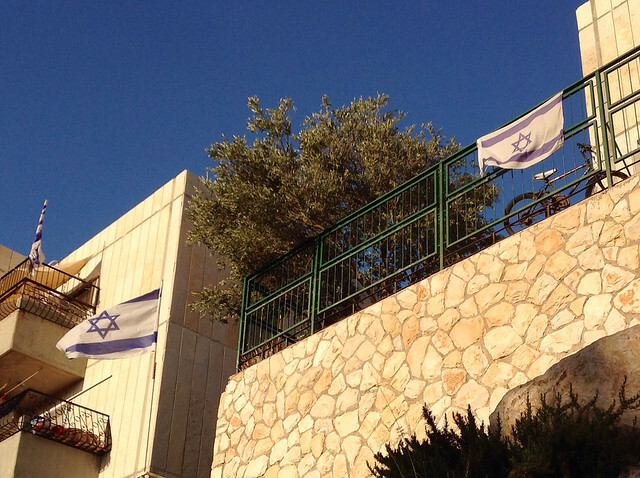 I’m such a Jewish mother–I live on the top floor of a building that is about as well-constructed as a cardboard box; the other day I called him and demanded to know what the army was doing to keep him (and the other soldiers) safe. He reassured me that most of the time he works underground. During an air raid they all go underground. So even if my knitting goes up in a puff of smoke, at least my little boy is safe! Just kidding, folks. We hope this ends with as little loss of life as possible. 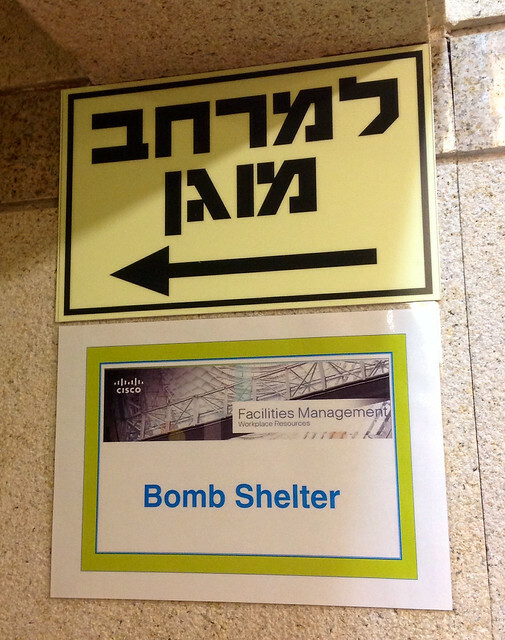 They posted new signs at work so that we can find the bomb shelters. However, the one on our floor doubles as a travel agent’s office and it was much to crowded to enter when the siren sounded at 6 p.m. I went into the stairwell, waited until I heard a few loud booms and then went outside to catch the minivan home. Four missiles were fired at Jerusalem and Maale Adumim. Two were shot down by the Iron Dome antimissile system and two fell into open areas. My husband was in a nearby store, buying wine for Shabbat. Someone said, “Is that a siren?” Everyone agreed, and continued what they were doing. When he got outside, a small crowd of people were photographing the missile being shot down with their cellphones. For people in Jerusalem, missiles are a bit of a novelty, although we are well within striking distance of Gaza. By, the way, 96 missiles were fired at Israel today. The total, since Operation Protective Edge began, is 442. The majority of Israel’s citizens live within range of Hamas missiles. This article shows the range of the M-302 missile, relative to large cities in the US, Canada, and UK (What if Terrorists Could Shoot This Rocket at Your Country?). In our area, we have 90 seconds to get to shelter, which is a lot more time than most people (15-45 seconds), but doesn’t seem like very much time if you have to deal with scared children or pets. We are trying to lead normal lives, although it does make some activities more difficult (a friend’s daughter who is getting married tonight had to find a new wedding hall yesterday because the hall they booked cancelled all its functions). Our local buses are targeted by stone-throwers and no one wants to risk a trip to the hospital for a dinner in town. My husband’s bus was stoned on his way home the other day but no one was injured. I feel safer at work than at home, because our building is a massive block of concrete. Our soldier son won’t be home this Shabbat. We’re not too concerned about his safety because he works in air force intelligence and that building is probably as well protected as any. I hope we all have a peaceful Shabbat.